Hazel Creek is located in the southwest corner of the Great Smoky Mountains National Park and has the reputation of being the finest freestone stream in GSMNP. It also has the distinction of being the most remote. Hazel Creek headwaters start on the slopes of Stateline Ridge at an elevation of over 4,000 feet, prime native brook trout habitat. In short, Hazel Creek is a little slice of fly fishing heaven, a place where fond memories are born. Hazel Creek is a backcountry fly fishing destination which means you are going to have to do a little hiking and camping if you want to experience some of the finest fishing for native southern Appalachian brook trout, wild rainbow and brown trout the Smokies has to offer. If you do make the effort, though, I don't think you will be disappointed. The primary access to Hazel Creek is by crossing Fontana Lake by boat or canoe. A boat launch is available at Cable Cove, accessible by Highway 28. Boats are available for rent and shuttle trips to Hazel Creek are also available at the Fontana Village Marina. Day trips and longer stays can be arranged. 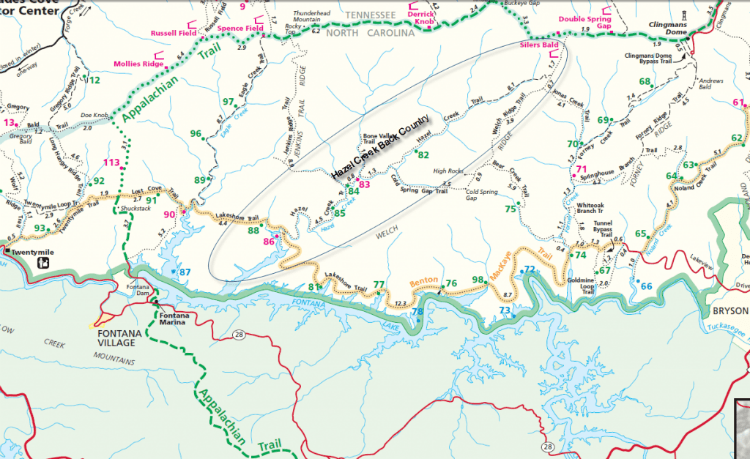 The Great Smoky Mountains Trail Map details the location of stream-side backcountry campsites and the applicable regulations. In short, once you cross Fontana Lake, Hazel Creek Trail provides good access to the stream for some 15 miles to the headwaters. Along the way are five backcountry campsites including Proctor Campsite #86, Sawdust Pile #85, Sugar Fork # 84, BoneValley #83 and Calhoun # 82. You must obtain a permit to use the backcounty campsites, and Proctor and BoneValley require advance reservations through the Backcountry Reservation Office at (865) 436-1231. Permits and further information are available from most park visitor centers. Visit our Great Smoky Mountain National Park Fly Fishing Guide for more information about fishing in the park. Late April to early May is one the best times to fish the Smokies including Hazel Creek. In the early part of April the Quill Gordons, Hendricksons and March Browns will be coming off. Mid to late April brings the emergence of the yellow mayflies, namely Sulphers, and Yellow Sallies (yellow stoneflies), the later is a fun hatch to fish. May brings the light colored mayflies including the Light Cahill, and the Sulpher’s continue to emerge. All the patterns you mentioned still work just fine in the April to May time frame. I would also pickup a few Light Cahill and Yellow Sally dry flies. Some of the hatches come off later in the day so you might want to have a few light colored may fly and stonefly nymphs on hand to fish in the morning before the adult flies start coming off. Have a great trip and drop us a line if you go and let’s know how you make out!